Having your dog run away when off-leash and then go missing is a terrifying feeling. If you have a pet that doesn't really listen, learning how to train a dog not to run away is crucial if want to let them roam on occasion. While there are several items in the market that help teach a dog the concept of boundaries, such as invisible dog fences that aren’t seen but felt, often coinciding with dog shock collars, there are other alternative options how to train a dog not to run away more humanely. Let's talk about “shock therapy” first. While popular and frequently purchased, there’s controversy among veterinarians, dog trainers, and animal behaviorists about how the shocks from these collars affect dogs not only physically but also mentally. Most of these devices can be set to a certain intensity, meaning owners can feel comforted that their pet isn’t experiencing pain, but rather a surprising vibration. However, for dog shock collars to be effective 100% of the time by preventing dogs from running away from you, they typically need to be adjusted to a high setting. After all, what’s going to stop your dog from running away after a squirrel best: a gentle, tickling vibration or a jolting, painful shock? Obviously, this presents a problem of harming your dog. Therefore, it may be better to learn how to train your dog not to run away rather than prevent these actions. Reliable recall is a common phrase in the world of dog training which, when successfully learned by a dog, results in a high success rate of coming to their owner when called. This and other related dog training methods is a more humane and effective approach to how to train your dog not to run away that you should probably use instead of fences or shock collars. In fact, studies have shown that this and reward-based training often have better results than relying on shock devices (Cooper, et al. 2004). Not only that, but when successfully grasped by your pet, this training will make them a more receptive and moldable student as well as create a stronger bond between the two of you. There are several tactics on how to practice a reliable dog recall and therefore train a dog to not run away, and when exercised routinely they will not only strengthen your bond with your canine but also teach them that obedience is rewarded, making them a star pupil for future training and behavior. Boredom. Lack of mental and/or physical stimulation is the most common reason why dogs run away from you even if you call them. If your pet spends the whole day without any socialization or interaction, he's likely to seek amusement elsewhere. Distraction. Sometimes your pet may not have any deliberate intention to run away and will be distracted by things such as a cat, squirrel or a mailman. Mating. Dogs that haven't been spayed/neutered are likely to be driven by hormones to find a mate. When you're on a walk and your pooch sees a potential mate, he may run away. This is one of the primary reasons veterinarians advise to fix your dog. Adventuring. Very unlikely for senior dogs and most commonly happens among young dogs and puppies who are more excited about the world and looking to explore. Need for exercise. It ties up to the first reason of boredom, where a dog doesn't get enough exercise and playtime, which is particularly important for active breeds with high energy requirements. They're likely to run away from you to expend the energy. When you understand the reasons for why do dogs run away even when you tell them to stop, you may be able to fix the issue by simply preventing it from happening. If that doesn't help, do not immediately resort to using dog shock collars; instead, learn how to train a dog not to run away effectively using the below tips. Setting an animal up for success is a major theme in dog training as it calls on your ability to be mindful of your dog’s general behavior as well as their surroundings, and the same applies for how to train a dog not to run away effectively. For instance, if your dog is terrified or overly-excited by motorcycles and you request the “Sit” behavior from them while at a motorcycle rally, chances are they’re going to fail the test. If you request them to sit while in your driveway with a stationary motorcycle parked nearby, they’re more likely to successfully follow your instructions because they are not as overwhelmed. While many dog owners will understand that major distractions are the reason their dog doesn’t obey, not many will realize that they have subsequently aided their dog in failing, as well as taught them a bad habit. Every time you call them from running off and they don’t return to you, you’re teaching them to ignore you. As your dog’s owner, provider, and friend you should know them relatively well. Use this knowledge to your advantage and to theirs by only requesting realistic behavior from them. This means acknowledging that in the realm of dog training, your pet is not the only student. 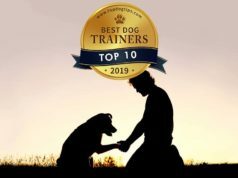 You, as the trainer, are also a student and it’s your responsibility to know your canine, know their distractions or triggers, and practice good timing. In relation to how to train a dog to not run away, you can set them up for success by choosing to only call them to you when you are sure they will obey. For hound owners this may mean choosing not to call “Here!” while their scent-scavenging skill has their powerful nose to the ground. Most dogs, especially those from hunting breeds, would rather track a scent than listen to you. Instead, practice patience and wait – even though it can be excruciating – for your dog to finish sniffing. As soon as they do, call them. Your dog is ten times likelier to return to your side if their attention isn’t on something else that’s likely to distract them. And thus, you’ve set them up for success by anticipating their behavior (a dog with their attention on something more interesting than me will result in them ignoring my calls) as well as practicing good timing (waiting for a dog to finish engaging with a distraction will result in them coming when called). Another wonderful tool in dog training that will help you practice good timing is a dog training clicker. There are many noise-makers on the market geared towards dog-owners. These devices are favorites of hunters who need their canine hunting companions to work independently but also obediently return when called. Dog whistles are the most popular choice for dog-parents with off-leash explorers because dogs – due to their keen senses of hearing – can hear them from miles and miles away. If you aren’t interested in your dog traveling that far from you, clickers work extremely well. If you have clicker-trained your canine companion, then clickers have the bonus over dog whistles of being associated with receiving treats. If you haven’t practiced clicker-training with your dog, it’s never too late to begin. It's the most easy and effective dog training methods. Clickers are hand-held, pocket-sized devices that do one and only thing: click. Although it seems insignificant, if you click the clicker every time your dog successfully completes a requested task or a behavior you want them to repeat more often, they’ll be able to acknowledge exactly what you want from them. It's related to famous operant conditioning but more specifically dog trainers call this technique marking behavior. We mark our dog by clicking the instant that perform a trick or task and then giving them a treat. Additionally, the clicker is a gainful way to find your dog’s attention when they’re in a close range as they come to associate it with receiving a treat. It may sound crazy, but dog trainers and animal behaviorists agree on this: if you want a dog to come to you, run away from them. Many times, pet-owners will make the mistake of running after an off-leash dog, and as naturally playful and social creatures, dogs are inclined to think this is a game of chase. What’s much more efficient in how to train a dog to not run away is to run away from them while calling their name in a loud, excited tone. Running backward, so you can keep your eyes on them, is enticing for them because they can see your expression and judge it to be happy. This is especially important if your dog already knows that running away isn’t the right thing to do, because it tells them that you’re not looking to punish them if they return to you. Running in a zig-zag pattern or even jumping and leaping are enticing for canines as well, because it displays playfulness and they’ll want to join you in your frolic rather than run off in the opposite direction. Dogs can read human emotions and they know when we’re upset from several cues. They register the tone of our voice, observe our body language, and even, as recent research has shown, read our expressions. A dog’s ability to feel guilt is part of what makes them such enjoyable, relatable pets. However, upon hearing their name said in an angry or irritated tone a guilty, off-leash dog is less likely to come to you. This could be because they’re anticipating punishment based on the frightening tone of you voice and/or body language. When learning how to train a dog not to run away and training the pup to be obedient off-leash, you should always use an excited, happy tone. This is especially important if they happen to run away from you. Never use the angry tone of voice. You can play hide and seek with your pooch and it takes zero training to get them to play along. If your dog knows the “Stay” command, request that they stay in one room while you sneak off into another to hide. Once hidden, call their name. They’ll love when they discover you crouched behind the bed or behind a door because you’ll greet them with excited praise. If your dog doesn’t know “Stay” well enough for this game, request the help of a friend so they can distract them with a toy or belly-rub while you hide. This game is fun for the both of you, but it’s also educational as it teaches your dog nose work, to associate and recall positive emotions when they come when their name is called. For the Name Game, you’ll need a partner and a relatively open, distraction-free place. In this space with your partner and dog, take turns calling the dog’s name. Almost like a game of keep-away, you can limit or lengthen the distance between the both of you with the dog running back and forth. Each of you will have a pocket-full or baggie of low calorie dog treats so when you call the dog’s name you can treat them, just as when your partner calls the dog’s name, they can treat them. Try to play these fun yet educational games as least three to four times a week. Dogs who know the fun ends when they’re called to come inside are more likely to ignore and/or run away from you. So if you’re allowing them to explore their freedoms in the front yard or meet new friends at the dog park, try not to force them to abandon their exciting activities immediately following you calling them to you. Instead call them 5 to 10 minutes earlier than you typically would, leash them, and stay in the entertaining environment awhile longer. Dogs learn how to behave based on how we respond to their behavior. That’s why you should always reward your dog when learning how to train a dog not to run away, whenever they willingly return to you and, likewise, never reward them when they ignore you or run away from you. Consistency is key, and it helps a dog learn tasks or behavior quickly. This may mean feeling a little silly as you may want to carry a clicker and bag of treats on you around the house, so they can be rewarded the instant they do something right, such as come to you when you call their name. Typically, when training, a form of punishment may take place of reward when a dog misbehaves. Many pet owners and dog trainers pick to practice passive punishments. Withholding attention from your dog, as difficult or as cruel as it may seem, is a more appealing punishment method when compared to negative punishment (hitting, yelling, crating, shock or prong collars). Not only that, but forms of negative or abusive punishment have been proven to be ineffective, sometimes even worsening issues your dog may have (excessive barking, jumping, pulling on a leash and so forth). However, given this information, when learning how to train a dog to not run away from you and/or be a reliable off-leash dog, punishment (even passive) isn’t necessary or helpful. Instead, when your dog ignores your calls, especially if they are off-leash in a non-fenced area, you should always respond by attempting to engage them rather than ignoring them. Really what “punishment” means here is simply the lack of getting a treat or a praise “Good job!”. Any method for how to train a dog to not run away may take some trial and error, but it's particularly true for using irresistible dog treats. Irresistible is key here. There’s a huge motivator for your dog out there just waiting to be found. This motivator could be cut up hot dogs, shredded chicken, pieces of bacon, small cubes of cheese, or even a whole burger patty. You’ll know when you find the motivator that your pup finds irresistible, because they’ll exhibit all the signs of excitement: dilated eyes, a tail wagging full-speed, and eyes that are focused on whatever you’re holding in your hand. When you do find the reward that they consider the most delicious, use it sparingly. You don’t want them to get tired of it too quickly. Dogs love surprises. A dog that knows exactly what they’ll be rewarded with is less likely to come when called. Rotating treats is a great tool when not only training your dog different tricks but also in gaining their attention while enjoying an off-leash excursion, because they’ll always be surprised and interested in returning to you to see what’s new. It's important that your dog understands these treats are rewards and not bribes. When you call your dog, even if it’s not from a far distance, do not show them a treat or rattle a treat bag. The treat should only appear to them once they’ve obediently come to you when called. Note: some dogs may not be as motivated by food and more interested in play. In that case, keep their favorite toy on hand. A few moments of play or interaction with the toy is their reward, and it could be one of the most effective ways on how to train a dog not to run away.